Ground Burial: In this most common type burial, a traditional casket is placed in the ground or inside a vault. Above Ground Entombment: In an entombment, the casket is placed in a mausoleum, which is an above-ground structure usually made of marble or stone. 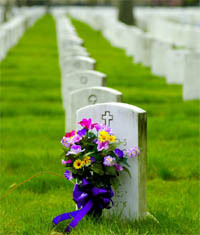 Cremation Burial: We offer burials following a cremation. After cremation, we can place the remains of your loved in a memorial urn and then insert that urn in a mausoleum. Alternatively, you can choose to bury your loved ones cremation remains in a family grave site or a cremation garden. High Quality Caskets: We are pleased to provide you with a large selection of premium caskets. We offer both caskets that are designed for burial and caskets specifically constructed for cremation purposes. Our caskets are available in a wide range of styles to suit every individual taste. Funeral and Memorial Services: Your family has the option to hold a funeral or memorial ceremony before or after the burial. Or you can simply hold a graveside service.